A spin-off series of Disney's Lilo & Stitch. In the new story, the alien creature Stitch is running off on the mad scientist Jumba's space scooter when he gets caught in a space storm and has to make an emergency landing at Izayoi Island, the southermost tip of Japan. There, he meets Yuuna, a spirited fourth-grade girl who happens to know karate. Yuuna tells Stitch about the Stone of Chitama, a mysterious object that can make any wish come true. However, he has to perform 43 good deeds to receive his wish. Seriously, how do I talk about something that feels like it’s from America in storyline, characters, and concept? The only thing they use is that they are in some alternate timeline in order to bring a new girl and culture in. Well, there is one other thing… Stitch is collecting good deeds. I don’t know about you but if the little creature is doing good things for selfish reasons, I don’t think it works. Also, his goal is not really good so it messes things up. The show does base around Japanese demon mythology instead of aliens, but I don’t really care for this. And that is coming from a girl who loves supernatural stuff. It just feels really forced because it’s a ‘find and capture’ game with yokai instead of aliens now, although once in a while they get an alien or two. It’s good if they had one or another, but not both! The ending also didn’t have really a good closer as it left it open for the next season. How they made a second season out of this I have no idea. The animation is pretty much standard series animation for a show that was created as a rehash of the original rehash of a movie. Yes, that’s a lot of rehashing and it seriously feels old. The artwork is bland is what I’m trying to say. It just looks like they pulled this together in a short time although pretty clean as a computer created. Scenes are reused many times over. Disney signs are all over the place from items that Stitch puts back together to some references. It got so bad that the dub even made fun of it. It’s just too much even for Disney. I found that the opening was changed rather badly between the sub and dub. The dub just used clips from the show in order to make a stupid opening just as how 4kids does most of the time. The dub sounds like it was done by 4kids, seriously bad with a lot of off kid language. 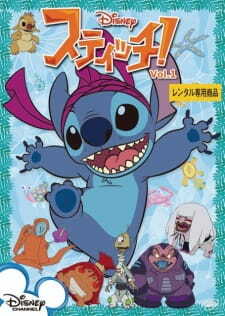 You can’t understand Stitch at all, though he should be able to speak a little better after living with Lilo so long. And this doesn’t make sense because half the time, stitch talks more then ever and others he acts like he doesn’t speak English. Now they do get better later on but it ends up to late. In fact, I think they even changed the voices for the dubbed version comparing it to the English version. It has the same childhood lesions as the show before, but they feel forced at times. Even the jokes are rather forced making me feel bored. The music is really bland with nothing that really stands out. The Japanese dub is so much better, actually having half of Stitch’s sounds actually being words. Seriously, most of the gibberish that he says in the dub is supposed to be complete sentences. Son Of a STITCH... Really now? Look, Lilo and Stitch is already enough, and I'm a fan when I was little and those episodes are perfect. Unlike this. I really don't know who the heck MadHouse Entertainment in the first place, but when I heard Parasyte: The Maxim and Death Note in the present day. I suddenly stunned when MadHouse turns into Disney MadHouse (Get it? Disney Clubhouse... and.. MadHouse... uhh... no? Okay). And, well, I've saw random episodes that I only pointed it out. So I only put a question mark there. And... from what I've observe, all I answered here is a Terrible... FN... NO! Don't watch this. And no... this is not a sequel... But a Rip-off... Just... Don't watch this anime, I have no fun watching this anime from the another cartoon. No... Don't. It has also some of this elements from Lilo and Stitch that remains in this universe, like Jumba and Plickley duos, funny quick liners some were not funny, a little memorable sequences and others that maybe it's not for you fans of Lilo and Stitch, like me, can handle this. Anime Nerds seem to hate the taint from American influences on Japanese animation. Having been to Japan in 2008, I have seen how popular Lilo & Stitch franchise was in person. The local Disney Store was largely core Disney Characters (Mickey, Minnie, etc) and Stitch! stuff. In normal stores you could see Stitch and Angel (pink stitch) stuff regularly as well in those claw machines for stuffed animals. This show was popular and was more intended to appeal to Japanese culture than for Americans to watch it as an imported animation. Its unfair that Americans give this show any rating at all to be honest. Its so the Japanese can connect on a closer level to a hugely popular character by introducing this series that lasted three seasons while the original american cartoon series only lasted two series. You can't even really compare the two except for how they were received by their respectable audiences. That being said, if you're a real Lilo & Stitch fan you'll enjoy it for what it is, a spin off and a different take on a popular Disney character. Anime Hipsters will probably not enjoy.